The "business end" of a season. A relegation dog-fight. Scrapping for points and survival. Pick a sporting cliche of your choice - plenty of them apply to the bottom end of the Premiership. Eight teams are separated by just 12 points, or three wins. The bottom four, who have all won six out of 17 games this season, have just seven points between them. To make things even more intriguing, they are some surprising names in the thick of the survival scrap, and, according to former Harlequins and British & Irish Lions winger Ugo Monye, "a giant could fall". BBC Sport tries its best to predict who might end up the wrong side of the table's dotted line come the last game of the season on 18 May. With five games left, the top four is almost sewn up with Exeter, Saracens, Gloucester and Harlequins occupying the play-off places. Northampton, in fifth, are eight points behind Quins, but must pay equal attention to the teams below as much as the one above. With three of their last five games against the current top four, Saints will want to ensure they don't get drawn into the mixer below, while Sale and Bath in sixth and seventh will be equally cautious. The pack below them has become even more congested because of last weekend's results, that saw Worcester win at Bristol and Newcastle beat Sale. They had a particularly big knock-on effect for another side wedged in amongst the bottom four - Leicester Tigers. The Tigers have never finished in the bottom half of the Premiership since the competition was created in 1987, but are third from bottom. This season, the former back-to-back European champions could be relegated and if the worst were to happen, it would make them arguably the biggest name to have dropped from English rugby's top tier. Tigers are on a woeful run of form in all competitions - just three wins in their past 19 games. After a humbling 29-15 home defeat by Northampton on Friday, Geordan Murphy's side are just five points above bottom-placed Newcastle. "It sounded ridiculous a couple of months ago to consider one of English rugby's giants even being in the conversation about relegation, but now it's a genuine possibility," Monye told the Rugby Union Weekly podcast. "Their form's been woeful. In the east Midlands derby, which I thought would be a turning point for them having all their internationals back against their bitter rivals, I thought we'd see something different and we didn't. "It was humbling. They looked poor, they looked rudderless at times. "Those are things you would associate with a team in 10th position, but you'd never think to associate it with a team like Leicester Tigers." Leicester's survival could arguably be determined in their next three games. Exeter at home, Newcastle away and Bristol at home sees them face the current leaders, the current bottom-placed side and the team a place and two points above them. "You can see we're very low on confidence," head coach Geordan Murphy told BBC Radio Leicester. "We made a mistake early in the game against Northampton and our heads dropped. We just seemed to be second best to everything. "There's no magic pill for giving people confidence and as a result, we're in the bottom end, we're in the mire." Murphy was named head coach full-time in December after an interim period in charge earlier this season and the former Tigers full-back admits the current plight is unlike anything from his playing days. "It makes me feel horrific," he said. "It's the toughest thing I've ever experienced in my life. "I'm totally with the fans in that it's not pretty. This is our lives, it affects everything we do and it's tough to take." "The one thing I've learnt about this competition is it's not finished until the end of the season," Worcester director of rugby Alan Solomons said after victory at Bristol on Saturday. Warriors have plenty of previous experience of fighting for survival since regaining their Premiership status in 2015. They are three points above Newcastle and face arguably one of the toughest run-ins with games against two of the top four still to come. 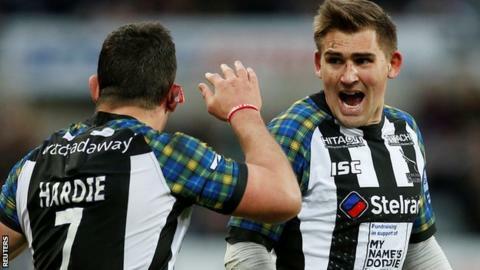 "There's a long way to go and we need to keep the momentum going," Solomons told BBC Hereford & Worcester. In most Premiership seasons, six wins would probably already be enough to guarantee safety, but for Bristol Bears their fate for next season is far from certain. Pat Lam's side are seven points above Newcastle, who they travel to face on the last day of the season, and a haul of 12 bonus points so far have helped keep their heads above water. "We've certainly left a lot of points out on the field throughout the season," Lam told BBC Radio Bristol. "You can't dwell on that, you've got to move on and there's five games to go. It's about taking the learnings and moving on to the next game." What makes the current state of the Premiership even more intriguing is the backdrop of potential ring-fencing in future seasons. Ending promotion and relegation between the Premiership and Championship would remove all the jeopardy currently being felt by the eight clubs. "From a sporting and fans' perspective, I love promotion and relegation," Monye said. "I got relegated [with Harlequins in 2005] and I know the effect it can have on your personal ambition. "I know the effect it had on people who were made redundant. It is tough - but isn't that sport? "There are winners and losers, there are consequences of all the actions you take, whether it be one match, over a season or over five years. "There will always be conflict when you try to merge the values of business with those of sport. "Everyone understands the relentless nature [of the Premiership] and if you're five or 10% off in any match, mentally or tactically, you're going to get beaten. "A giant could fall - like Leicester." Harlequins and England scrum-half Danny Care agrees relegation should stay, despite having also been relegated during his career, with Leeds in 2006. "As soon as you stop it [promotion and relegation], you'll lose that competitiveness and that special thing the Premiership is," Care told Rugby Union Weekly. "This year, anyone can beat anyone and it's amazing to see. As soon as you cut that off, you just lose that ambition."